In this post, we are going to walk you through different methods of removing bloatware from Windows 10 PC desktop, laptop, or tablet. Bloatware accumulating on Windows operating system over time is one of the major concerns of Windows users. Bloatware and crapware causes your Windows 10, or any other Windows for that matter, to run slowly as it sits quietly on the hard disk consuming hard disk space as well as system resources. Bloatware and crapware gather on the hard disk over a period of time, thus affecting PC performance. Here, we are going to discuss best ways to remove bloatware from Windows running device. Although, we will be focusing on Windows 10, but you can go ahead and try these on other Windows versions as well. Bloatware and crapware are often used interchangeably, but in reality they are different from each other in a way they impact PC performance. Bloatware is a program or a collection of programs that come pre-installed on Windows device along with other system programs. Bloatware is money minting software whose main purpose is to make money for Microsoft’s partners. In some cases, it may actually be useful, but mostly they are not. Useful bloatware could be any third-party antivirus tool that comes pre-installed with Windows OS. You probably get asked during the installation setup whether to install such bloatware or not. On the other hand, Crapware is any software that comes pre-installed on Windows as a part of some other important program which you cannot afford to forgo during the setup process, and is important for normal functioning of the Windows OS. Crapware can end up on your device because manufacturer pushed it onto your device before the purchase, or it got installed as a part of some other program which installed on PC. Crapware aren’t of any use actually. They often appear in the form of a toolbar options on a web browser, which loads along with a browser app at startup resulting in slowing down PC startup process. Crapware are intended to make some extra bucks for developers and advertisers. Its better to stay away from them as they are not of any particular use, moreover, they slow down apps opening and PC startup. Now that you know what are bloatware and crapware program, next, see different ways to permanently get rid of these unwanted software from your Windows 10, or any other Windows version, so that they don’t have an adverse impact on your device’s performance in future. There are plenty of amazing third-party apps and program available on the internet that work to remove the bloatware and crapware from Windows 10. Here, we have managed to assemble a list of some of the best programs available for cleaning your Windows device from bloatware and crapware to ensure that they keep on performing at an optimum level. Here’s how to use these programs to clean bloatware or crapware from Windows PC desktop or laptop. In case your Windows device is infected by bloatware, uninstalling one by one could take a long time. You can save yourself time when uninstalling lots of bloatware using an amazing tool, see the steps below about how to use the tool to remove bloatware from your Windows device all at once. The program we are going to recommend is called Decrap. It scans entire PC and presents bloatware in a list from where you can uninstall them. 1 – Download Decrap here and install it on your Windows PC. 2 – Launch the tool and scan PC with it. 3 – Once the scan is complete, Decrap will present a list of unnecessary programs that you can remove from your PC. Find bloatware under ‘Third Party Software’ or ‘Automatically Starting Software’ options and select the ones who wish to remove and hit the Next button. 4 – Create a restore point when prompted to be on a safe side in case something goes wrong. 5 – After creating a restore point, you will be asked to remove select program automatically or manually. Check the program who wish to remove from your device and hit the automatic option and let the software do its work. 6 – Once completed, restart PC after which your device will be bloatware-free. Take care when selecting programs to delete via this tool. Know what you are deleting to avoid accidentally selecting some important system program. Possibility of accidentally selecting and removing important system program is always present when using automatic bloatware removal methods. If you are not confident with automatic method, use the manual removal bloatware / crapware method. If there is only a small amount of bloatware installed on your PC, you can download any free available bloatware removal tool from the internet for removing bloatware. There are many quality third-party software available on the internet, if you don’t wish to use built-in removal tools in Windows. Some great tools for the purpose include CCleaner, IOBit Uninstaller, and similar other tools. Use any of these tools, or find your favorite tool on the internet and use it to remove bloatware to free up disk space after which you will definitely see a jump in system speed. Always take care when choosing bloatware for deleting using a third-party tool. You won’t want to select an important program unknowingly when selecting bloatware or crapware for removal, which could later result in system issues. There is another great tool called RemagePlus, which you can use to remove bloatware / crapware from your Windows PC desktop or laptop. This multipurpose tool fixes PC errors, optimizes PC, checks hardware related issues, finds and weeds out malware for increasing the speed of your Windows device. Download ReimagePluys, install the tool and launch it, select ‘Start Scan’ option to diagnose PC issues and click ‘Repair All’ option to allow the program to fix issues on your device. Microsoft has introduced its own Windows Store with Windows 10. It comes pre-installed on every Windows 10 version. There are many Windows Store apps are pre-installed on your Windows such as Weather, News, Stock, and others. If you are using these apps, then fine. Or else you can remove them from your Windows device to free up hard disk space and speed up system startup in the process. In order to get rid of these apps, go the Start menu, right on the app you wish to remove, and select Uninstall from the context menu. You can use similar method for removing any Windows Store app that is installed without your permission. One other major issue on Windows OS is many software come with toolbars that get installed with that program without your permission or when you accidentally select them during the installation process. These toolbars can cause browser to lead slowly, and if that browser is your default program, it can slow down PC startup as well. Although you can use tools given in the links above to remove crapware just like any bloatware, but there is one program that specializes in removing crapware and unnecessary toolbars from Windows device. And the name of that program is AdwCleaner. 1 – Download AdwCleaner and install it on PC. 2 – Run the program and scan your PC with it. 3 – Once the scan is complete, select programs, tabs, folders, files, etc. you wish to remove from your device. 4 – After selecting unwanted programs, click the Clean button and let the tool perform its job. All done. Restart PC after which you won’t have to deal with annoying crapware toolbars, and bloatware on Windows 10. If after exhausting all the above mentioned option, bloatware remains on your device, its time to take the ultimate steps and clean install Windows 10. This is useful when you are fail to distinguish between important programs and unwanted bloatware. If you are using a Windows running device from an established manufacturer, some sponsored programs and apps make their way into your device via pre-installed Windows copy. 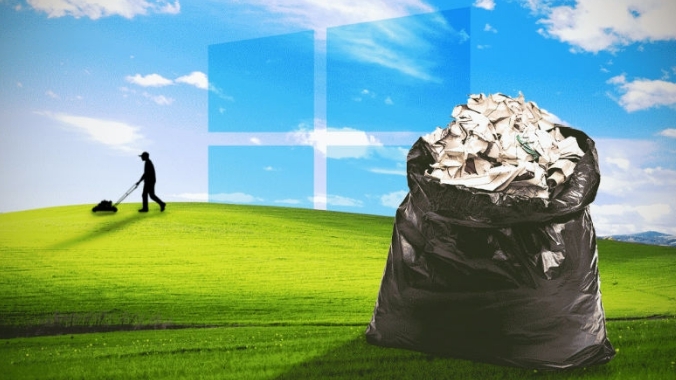 To get rid of all that junk, perform clean installation of Windows 10 or other OS. For that purpose, you can visit Microsoft’s official post to create Windows 10 installation media, which is required for clean installing Windows 10. Although clean installing Windows 10 will be a lengthy process compared to what we have already discussed above, but it will surely less risky as it will ensure Windows 10 installation without any bloatware or unnecessary software. We cannot guarantee if clean Windows 10 installation will be totally free from bloatware, you can check for yourself on your device. Now that you know how to tackle bloatware issue on your Windows device. Next step should be to ensure that it stay that way in future. Make sure your Windows copy remains free from bloatware or crapware in future. Here are some tips to tackle the issue. Install only the important elements when downloading or installing any app or program on Windows. Deselect unnecessary programs before installation. Look before checking boxes for installing items during an app or software installation. Download programs from the official source if possible to avoid any malware or malicious bloatware getting downloaded onto your device. These were some of the best way that would be of help to you when addressing Windows 10 bloatware problem, according to us. Of course, you can use your preferred tool to remove bloatware, which may different from the ones mentioned above. Do let us know if you found this post useful in removing bloatware from Windows 10 device in the comments section below.